I first married in 1963, whilst still a member of the Royal Navy submarine service stationed at Faslane, near Glasgow. Irene Campbell was a girl from Lochgilphead, Scotland. She was working as a nursing aide at the local hospital. Later posted to the 6th Submarine Squadron based in Nova Scotia Canada, we were blessed with a beautiful daughter. Caroline Patricia was born on 14th January 1965, one hour and twenty minutes short of my birthday which fell on the 15th January. This was a short and disastrous marriage, if interested in the details they are found in my latest book ‘The Royal Navy & Me’ . I began divorce proceedings in 1968 and shortly after gained custody of my daughter, Caroline. In 1969 I moved to Prince Edward Island, where I met my present wife. Linda is an island girl from the South Rustico area. We met at the KMart, where I was working in the automotive dept. KMart had a policy of “Satisfaction Guaranteed or Money Cheerfully Refunded”. Under such terms I think Linda felt safe in agreeing to wed me. If things didn’t work out she could always return me to the store for a full refund! We have been married happily for more than forty years. Kmart is long gone, so it looks like Linda is stuck with me now!! In 1970 I transferred to a KMart in Windsor, Ontario. Linda and I set up our first home buying a mobile home in Essex. A year and a half later we moved to the Kmart store in Sudbury. October of 1973, our second daughter, Susannah May was born in the Sudbury General Hospital. 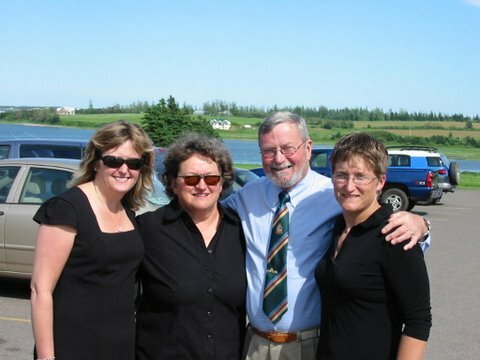 We then decided to return and make our home on Prince Edward Island. That is where you will find us today. We first settled in Cymbria and later in 1986 on a lovely peaceful fifteen acre hobby farm in Ebenezer. However aftyer the family had grown the house became to big for two people and in 2013 we moved to a new smaller house in Abram Village that we now share with our two dogs and a cat. Caroline married Mark Campbell, an island boy in 1991. They live and work in Halifax, Nova Scotia. They have two beautiful children, the pride and joy of their grandparents. We spoil them at every opportunity. Melissa is 15 years old and Christopher is 10. Susannah became a teacher and moved to Newfoundland to teach in the town of Grand falls. Susannah keeps busy doing a variety of activities such as biking-running mountain climbing and being lowered out of helicopters. She recently set up home with her new partner Ruth and her three children. Ruth is a nurse and a lovely person. This is a huge improvement on her last partnership, which was a very selfish and one sided situation. All their friends are happy and pleased for them, which certainly includes Mom and Dad. Very interesting reading…I obtained your short story about sinking to crush depth because of my interest in diving and the sea. I then followed the link to your web site. My father was born in the early 20s in the Midlands. England. I was lucky to visit England, Scotland and Wales when I was younger. One of my favorite cars was the Rover…I thought it was called the princess…but looks a lot like your 79. Anyway, thank you for the story. Nice to hear from you and thank you for your kind words, they are appreciated. The Rover was always known as the poor man’s Rolls Royce! The Princess was not a Rover product, it was made by Austin as a luxury car, it was a direct competitor to Rover in the fifties. Lots of Campbells here on PEI also lots of MacDonalds, if you know Scottish History the Campbells were traitors and sided with the English. They attempted to wipe out the Clan MacDonald, obviously they didn’t do a very good job!!! Where are you located?and are you a soccer fan? Lots of teams come from the Midlands! I’m an Arsenal fan but you probably know that if you read my web page! Perhaps you will find time to read my two books, I’m sure you would enjoy them. Don’t mean to be a salesman! and they are available as EBooks which are quite inexpensive $1.99 ea.